.20 CT TDW per link. This bracelet is also available with plain gold links which can be replaced with diamond links as you go. Perfect for a modern, two-tone look! .04 CT TDW per link. Our stylized 'horseshoe' link comes as an A and a B section to complete the alternating effect featured here. 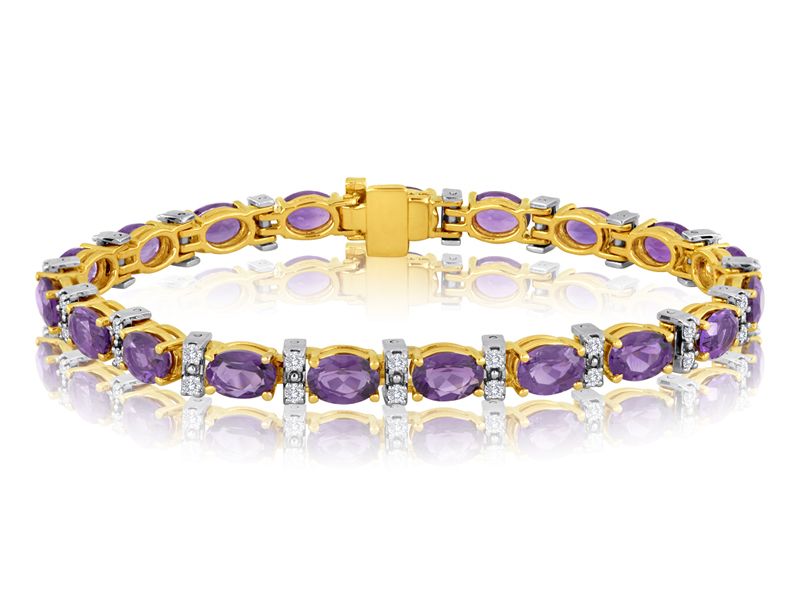 This bracelet is the same as the 912 pink available complete in gold but without diamonds. Diamond spacer sections are 1/5 CT TDW each and can be added over time. The 912 is unique in our collection because of its attractive scalloped links and because it is available as a complete gold bracelet without any diamonds. The diamond sections are additional and can be added over time, or the bracelet can be worn as a plain gold piece. Beautiful in 14K pink. .03 CT TDW each. The diamond spacers are always set in white and the knots are available in 14k white, yellow and pink gold. Stunning as a complete bracelet but beautiful as a two-link starter bracelet as well! Our lady's second amendment piece! Celebrate your right to bear arms by wearing our .38 special 14k gold and diamond cartridge bracelet on yours. The year 1911 was significant in our nation's history for many reasons, but one of the most important was the adoption of John Moses Browning's M1911 pistol by our nation's armed forces. At over 100 years old the .45 ACP cartridge is one of the best known in the world and our version, in 14K white and yellow gold, makes one of the most distinct pieces of jewelry a man can own. The 826 is the classic Gent's diamond bracelet. Both the links and the channel-set center plate are made and finished by K & E here in New York City and the weight and craftsmanship of the piece are something to be proud of. Featuring 11 diamonds weighing in well over a carat total this bracelet looks and is the part. Our .03 CT TDW blossoms are available assembled with our 502 stems or as shown here on their own. This bracelet looks especially good in a tri-tone pattern. Stems feature .03 CT TDW white diamonds, flowers feature .04 CT each. Available in white, yellow and pink gold featuring white, brown or blue color treated diamonds. 1/5 CT per link. This bracelet is available in any combination of shapes and colors. 14K white, yellow and pink gold and round, princess cut, marquise, oval, pear and heart shaped diamonds. We can supply natural colors from white, yellow, light brown, medium brown and dark brown. We can also supply a selection of loose links for you to arrange according to your tastes. Approximately .15 CT per link and available in all shape and color combinations. This bracelet features fleur-de-lis instead of heart details on the links and two-piece castings which means we can supply prongs in the gold colors that will best compliment the diamonds. Tapered from 1/2 CT centers to 1/5 CT at the ends. 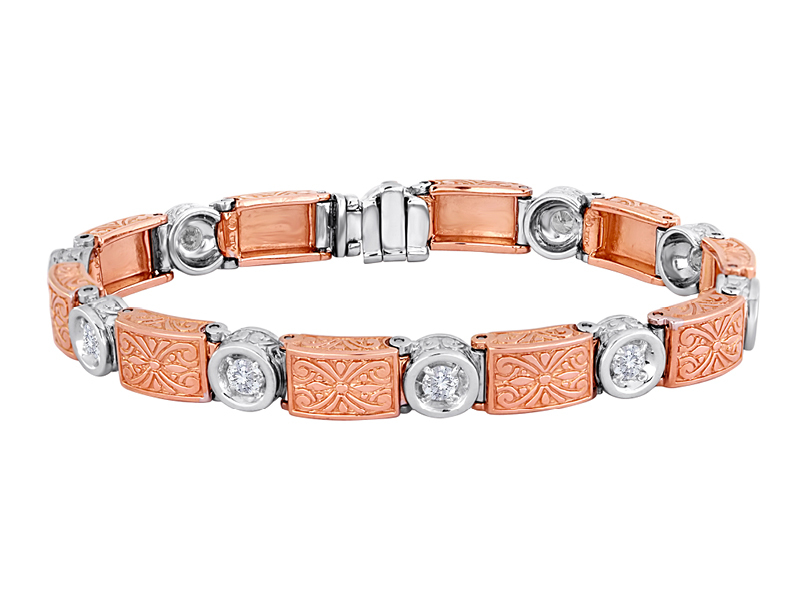 This bracelet is a one of a kind piece featuring a unique combination of fine natural brown diamonds. However these links are available individually as well. They assemble with our 862/864 series as 'center' links and are suitable for remounting heirloom diamonds. These links are the same series as the 555 made in two-tone. This bracelet features cape diamonds, but like the 555 can be made to your specifications. This is our most substantial bracelet and looks and feels the part. This is an heirloom quality piece that will be passed on through your family and treasured for generations. Each link features one .15CT diamond and a filigree spacer available in white, yellow or pink gold. This is a K & E classic that is still relevant and attractive today. Available in a high polish or as shown here with a satin-finish. Each link has a .09 CT diamond. Available in 14k white, yellow and pink gold. .05 CT per link and available in any combination and pattern of colors. This bracelet features the same links and spacers as the 756, but with .15 CT color treated blue diamonds. 1/5 CT per link available in white and color treated blue diamonds. All shapes available. .24 CT TDW per link with three diamonds set from the back. 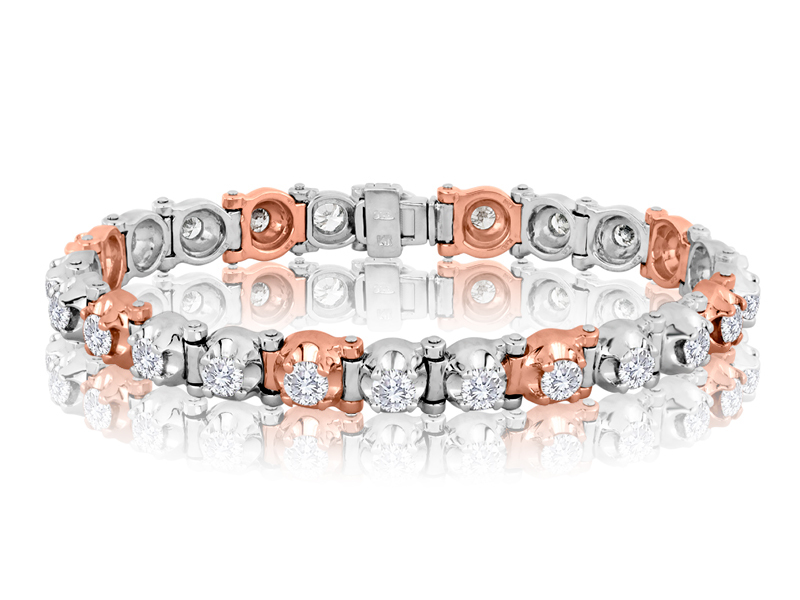 This is K&E's classic two-tone bracelet, shown here with pink gold brushed links and white gold high-polished spacers. The brushed pink gold shows off the brilliance of our diamonds, and the high-polished spacers accentuate the contrast. .03 CT TDW per link, 7mm x 5mm oval birthstones. Available in all birthstones and any combination. Perfect for a mother's or grandmother's bracelet. Also available in bezels.